Marion Pooke was from Natick, attended Smith College, and taught at the Walnut Hill School. She studied at the Museum of Fine Arts from 1909-1913, and later had a studio at the Fenway Studios. Pooke’s work is indicative of the academic style of the Boston School, a staid and measured approach later decried by twentieth-century modernists. While Pooke’s works are primarily traditional portraiture, her women are often painted in profile and represent the figure of the turn-of-the-twentieth century New Woman, rather than a Victorian ideal. The title of this painting does not refer to how we use this term in contemporary vernacular; rather, it references a theater engagement or show, in town for a single performance. Pooke’s depiction of a woman who was likely an actress or performer references the politics of gender and class at the turn of the twentieth century. Far from being a demure middle-class woman posing in her Victorian parlor, Pooke’s central figure is more marginal, for she engages in public performance. She does not look at the viewer, but rather sits in profile and holds a mirror. 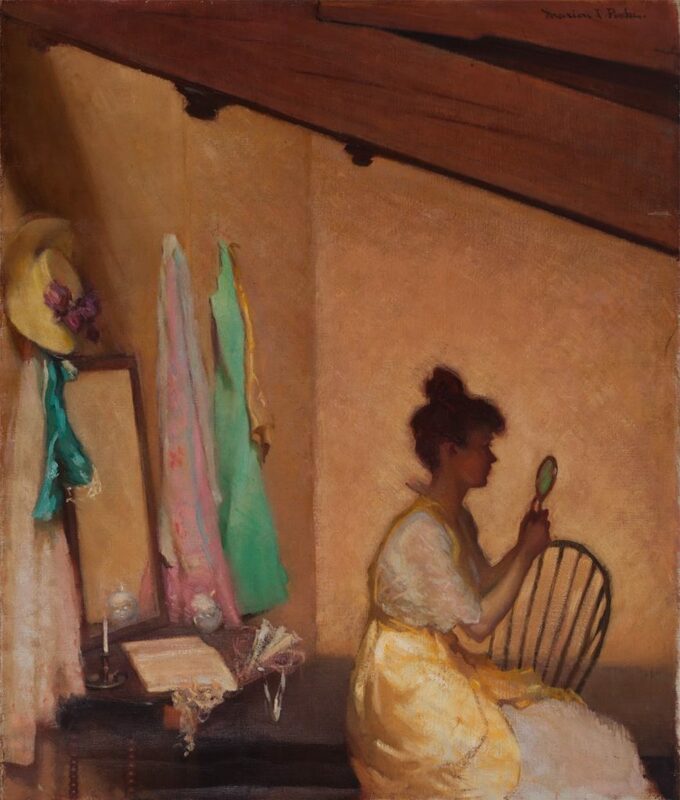 The contents of her dressing table are reflected in the mirror behind her, a subtle reference to voyeurism and the gaze.